Smart, scalable and easy to use. 4Sight2™ is the next generation of calibration and management software that provides full visibility of all your available assets, instruments, and resources that affect the maintenance, process efficiency and regulatory compliance of your site. Improve process efficiency and quality of data. Easy access to Audit trail and asset history. Schedule calibrations and prevent downtime. Define and control calibration routines and calibration procedures per plant and location. Full visibility of your assets, instruments, and resources. Available anywhere, anytime via the Internet. Scaleable from single use to global multi site operation. Manage the calibration of all the measurement devices for a specified business location. Setup a schedule of calibration work for technicians. 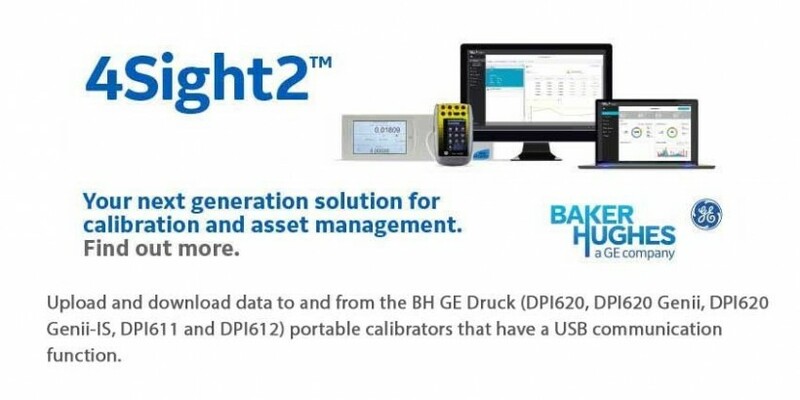 Upload and download data to and from the BH GE Druck (DPI620, DPI620 Genii, DPI620 Genii-IS, DPI611 and DPI612) portable calibrators that have a USB communication function. Manage the calibration records for devices that are not supported by a portable calibrator (Manual Data Entry). Inspect your calibration history records. You can also make a permanent record of each calibration certificate. For example: For ISO 9000 quality control procedures. The 4Sight™ 2 Calibration software has been developed and tested with Google Chrome. 4Sight2 allows significantly lower investment costs and minimal IT requirement costs in terms of server support, upgrade management and data backup. Users can simply log in to the application software from a browser, with location and PC compatibility. Alternatively, 4Sight2 may be installed directly on a company server. We offer a range of supported installation options if required. 4Sight2 enables access to mobile paperless calibrations, automated field calibration and deviation management. Users can record the cause of deviations, investigate the reasons and focus on a resolution. The audit trail demonstrates that a robust solution is in place to manage deviations with strict procedures for corrective action and preventative action (CAPA), reducing operator error and improving overall quality. 4Sight2’s historical trending module allows a device’s performance to be monitored over time. This powerful feature is a key tool in improving efficiency and planning preventative maintenance. The unique As found and As left interval analysis allows users to easily report on asset performance by analyzing historical data and drift. This flexible tool produces reports to assist calibration managers, tasked with decreasing calibration intervals, to make a qualified recommendation. This reporting and analytical job that used to take a lot of time and resource, can now be done in just minutes without risk of miscalculation or transcription errors. Reference standards used during a calibration are traceable to instruments and work orders. This powerful KPI (Key Performance Indicator) allows managers to prevent and trace issues with required references that are overdue for calibration or for those found to be out of tolerance. Auditors expect a robust system for managing failed references. The “Reference Used Report” quickly displays the list of calibrations associated with the reference, ensuring a speedy investigation and the planning of rework actions. 4Sight2™ Calibration and Maintenance software provides a highly flexible information system with the tools for managers to plan, review and adapt the maintenance workflow and for technicians to work efficiently to defined and automated calibration procedures. 4Sight2™’s mobility and maintenance modules delivers the ability to move to a fully paperless system, automating the process of data collection and deviation handling. The easy-to-use module allows technicians to record maintenance and calibration activities in the field, using hand-held mobile devices like tablets and laptops. GE's 4Sight2 is available to purchase from Cuthbertson Laird Group now.